It’s been more than 18 months since the Ebola epidemic began its devastation through Sierra Leone, Guinea and Liberia, causing thousands of deaths and testing health systems to the breaking point. Since the beginning of the epidemic there have been more than 28,000 cases of Ebola in West Africa, more than 11,000 of those resulting in death. Among those who perished are more than 500 health workers who worked, tirelessly at the frontline, giving their life on the line to stop the outbreak and help the victims. These shocking statistics are all the more gut-wrenching when you hear the heroic stories of frontline health workers like Dr. Ameyo Stella Adadevoh, who correctly diagnosed and contained the first case of Ebola in Nigeria in 2014. 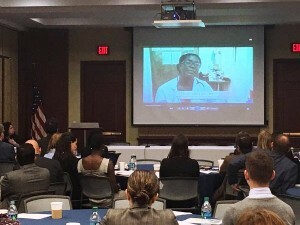 Ameyo’s sister, Dr. Ama Adadevoh, told Ameyo’s story to congressional and executive agency staff at a Congressional briefing on October 29th here in Washington. Ama’s telling of Ameyo’s story – correctly diagnosing the case, preventing further spread of Ebola in Lagos, a city of about 16 million, and utilizing improvised personal protective equipment – made jaws drop in the audience. Ama’s reason for coming to Washington is the same reason why her family started the a Health Trust in her sister’s name. 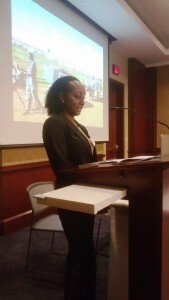 And it is the same reason the Frontline Health Workers Coalition and International Medical Corps, IntraHealth International, ONE Campaign, CARE, Management Sciences for Health co-sponsored the briefing in cooperation with US Reps. Nita Lowey (D-N.Y.) & Ander Crenshaw (R-Fla.): frontline health workers, especially those in the most remote and rural settings in developing countries, must be better supported to save lives and help stop future health threats. 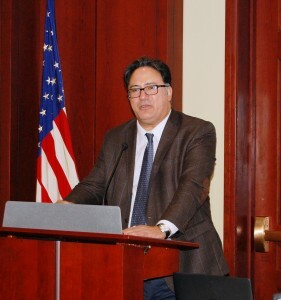 USAID global health chief Dr. Ariel Pablos-Méndez reiterated this point to the briefing participants, telling them that a strong health workforce is absolutely critical to achieve the core US government global health goals of ending preventable maternal and child deaths, achieving an AIDS-free generation and ensuring global health security.Dr. R.J Simonds of the CDC Center for Global Health continued with this theme, discussing the President’s Emergency Plan for AIDS Relief’s recognition of the central nature of health workforce strengthening to achieving PEPFAR’s targets in fighting HIV/AIDS, adding that a resilient workforce is central to the planning by the US and several partners to ensure prevention, detection and rapid response to future threats like Ebola under the Global Health Security Agenda. Dr. Jen Kates of the Kaiser Family Foundation, reminded the audience that there’s a long road to go – more than 400 million people lack access to one of more essential health services provided by frontline health workers, according to the World Health Oganization and World Bank. But Kates added that there are several great case examples of major successes in global health outcomes being driven by a sustained focus on bolstering the frontline health workforce. The momentum’s building for such a focus on frontline health workers. Reps. Lowey and Crenshaw recently sponsored a resolution – H Res 419 – with a growing number of co-sponsors, that would recognize frontline health workers’ amazing impact, often at risk to their own safety. It also would urge strong U.S. leadership and a coordinated U.S. government-wide action plan for its investments to help those same frontline health workers. And, as Dr. Pablos-Méndez reminded the audience at last week’s briefing, very important on the road ahead will be the adoption of the Workforce 2030 Global Strategy by the world’s health ministers at next May’s World Health Assembly.